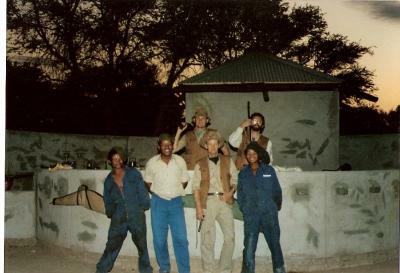 I have an African Hunting story to share and this took place in the Kalahari region of Namibia (the country just north of South Africa). We left the Transvaal (South Africa) for a more exciting hunt in this south-eastern part of Namibia. Driving many hours, we were like a bunch of excited children going on a holiday and the time went quickly. We passed through the Mata-Mata border gate as it opened that morning, entering SWA (Namibia) in our VW Caravelle and trailer. There were four of us, George, Dennis, Dennis and David. We arrived at the farm to a very friendly reception by the owner and his wife and were eventually introduced and escorted by our two guides. I felt a little apprehensive as our guides seemed quite young, but decided it was no problem as they had grown up in the area and were familiar and accustomed to it. Our camp consisted of a lapa area and cottage type tents. We set up, checked our weapons etc and were collected to do our final sight-in shots at a few hundred yards. We returned to camp and left that afternoon to do some hunting. I may add that some of the finest springbok were shot at random out of the herd, giving me two out of two springbok going well into Roland Ward. I was pleased with my results so far, and didn't let onto our two young white guides as to the extent of hunting which I had done in the past. My companions all fared pretty well and we all returned to camp and at sunset started drinking a few OB's around the fire. The trackers who had just finished skinning came over and started to chat and we learn't that a few Kalahari male lions had left the adjacent Kalahari Gemsbok Park (Kgalagadi Transfrontier Park nowadays) and were captured on the Ranch just a day before we arrived. Our two young "Great Hunter Guides" were staying in a tent not far behind us. We reversed our VW Caravelle so as the rear was facing their camp's direction and opened all doors and windows including the rear. We let the dust settle and watched them from the dark for a while. The only solid structure was an outhouse close to their tent. They had a little fire going and were cooking something on it, sitting next to it on their haunches. We had hold of the tape "Calls of the Wild" or something named similar which starts with a male lion sequence of roars which we inserted and pushed the play button with this huge sound system's volume turned up high. We had quietly gathered around in the dark watching them as the vehicle's tape player started the Roar and then silence. These young guys ears picked up and one said to the other, "@#%*,.. Flip het jy dit gehoor?" ( @#%*, Flip did you hear that? ) and then suddenly another roar boomed out and that was enough! The guys charged for the only solid structure which was the toilet and they ended up in a struggle, both trying to get into the door at once. We couldn't contain ourselves with laughter and all of us (including the trackers) ended up rolling around in the sand with laughter. They obviously then knew it was a joke, these two guys with all that pride and attitude earlier that day... and now they sheepishly came to investigate and we all ended up laughing it off. We went out the next morning, took a few nice Gemsbok and had the best hunt of our lives. There may be a few stories passing around about this, but this is the original. I have since left my country and long for these special times. Nothing compares to Africa. I have hunted and guided on both continents and fished Alaska but dearly miss home and moments like this every day. Hope I win ! I hope that you and the family are welland happy; how about an email when you have a chance. Since our time in Douglas, Ive wanted to stay in touch with you. I also was on this hunt, and I remeber it well. I seem to remeber four dennis's altogether though. On the way there we went through the park, and had to have all the rifles and handguns sealed up. I remeber they ran out of there normal gear, so the handguns and rifle bolts went into a sealed bag. We passed a pair of porcupines, mating in the middle of the road. We had to wait for the gas bottles to warm up in the sun before we could use them; for making our breakfast. All the paint was sandblasted off the front of the trailer. Comes from travelling at high speed on roads made of sand. We almost ran out of petrol on the way back and had to wait for a petrol station to open up. One of the tyres on the caravelle blew out. They are heavy vehicles to Jack up, especially on a sand road. One of the wheelbearings went. we replaced it with a hankie and some grease, pounded in with a hammer and a small drift. A meandering story with a very funny joke. To see those two guys trying to get in the outhouse must have been hilarious! The joke was very funny. I would have liked to learn more of the hunt and what happened to the black maned Kalahari Lions. Impressive story. Not many out there like that. I was impressed by the story about the journey Dennis had taken in Africa. I know he has many exciting adventures like this one that he could and would share with all of us if given the opportunity. We would love to hear them. Thank you!